With pyramids as stunning as those found in Egypt, Sudan also offers the same travel attractions but on a less touristy scale. Located almost three hours away from Khartoum, the pyramids of Meroe are on the same way with the travel attractions of Musawarat and Naga. With each site charging you 10 Sudanese Pounds, you have yet to pass Musawarat and Naga before getting to the Meroe pyramids, and you’ll find them just abutting on the Nile Petrol station, wherein you’ll be greeted by a clear yet sandy road. Actor and NY Times Travel contributor, Andrew McCarthy, was brave enough to tag along with his friend across this North African Arabian state just to take witness of the stark beauty of the pyramids of Meroe (“Pyramids by the Nile. Egypt? No, Sudan”). In Kerma we climbed its deffufa (Nubian for “mud brick building”) dating from 1500 B.C. — also deserted. In Karima, a bustling river town, I sat with silent and serious men smoking a hookah. We ate ful, the Sudanese staple of watery bean stew. A man welcomed me into his home. In a simple concrete room I perched on the edge of a metal cot under pink-washed walls as his young daughter poured me cup after cup of sweet tea — and then coffee. I left, wired from their generosity. .. They (pyramids of Meroe) are far smaller than the Great Pyramids of Egypt, but the setting, the stillness and the scope of the Meroe site are what make it impressive. 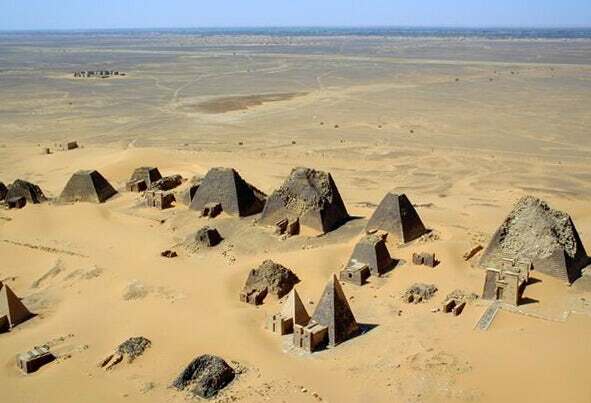 About 200 pyramids stand deserted amid the dunes — the tops of many of them were lopped off in 1834 by the Italian explorer Giuseppe Ferlini in the mistaken belief that riches were buried inside. At sunset and again at dawn I walked the deserted site. So communicate with us today to start planning for your next trip to Sudan!